Village of Exeter: Are you ready for some Exeter-Milligan Football? Are you ready for some Exeter-Milligan Football? 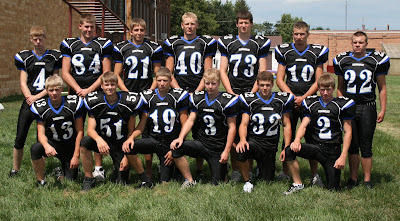 The Exeter-Milligan Timberwolves will start their season at home tonight against Giltner at 7 p.m. in Milligan. Next week the Timberwolves will travel to play Heartland. Exeter-Milligan Cheerleaders Ready to Go!!! Girls Golf Season Starts with a BANG! !